As we’re currently experiencing an extended period of cold, snowy, icy weather, what better time than now to post this atmospheric watercolor by Jerry Bywaters? 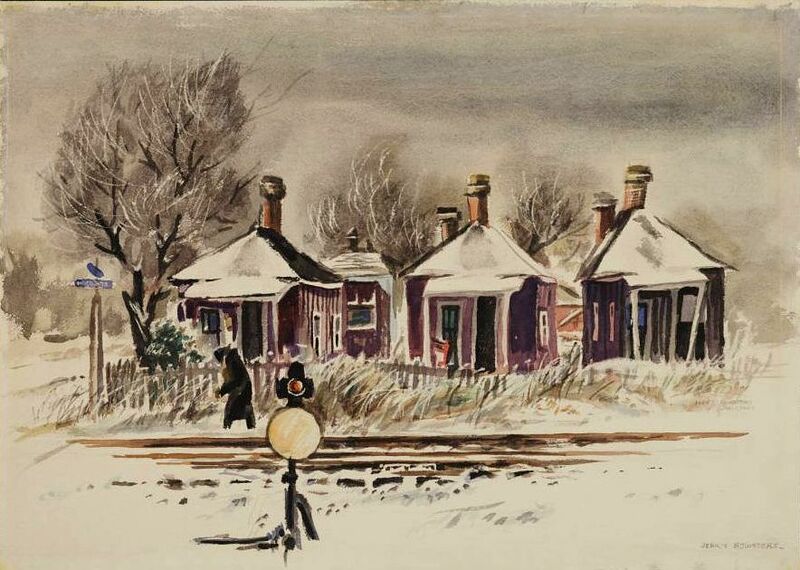 Titled “Along the Tracks,” it was painted during a very cold and snowy early January of 1947, in the area around Fair Park (where Bywaters worked as the head of the Dallas Museum of Fine Arts). Railroad tracks ran on either side of Fair Park — the Texas & New Orleans tracks ran along Trunk on the west side, and the Texas & Pacific tracks ran along Pacific on the east side. The DMFA was on the very western edge of Fair Park, and as it was bitterly cold, Bywaters probably wasn’t traipsing any farther than he had to — the west side of Fair Park near the T&NO tracks would certainly have been more convenient for him. But I came across a photo that looks pretty much the same as the scene Bywaters painted, only from the T&P side to the east, so who knows? Jerry Bywaters’ painting “Along the Tracks” is from the Bywaters Special Collections in the Hamon Arts Library at Southern Methodist University; it can be accessed here. As far as I can tell, that street sign doesn’t actually say anything, but if you see something in the scribble, let me know! The 1916-ish photograph of the Pacific and Parry intersection is from Dallas, The Deciding Years by A. C. Greene (Austin: Encino Press, 1973). When Bywaters painted “Along the Tracks” it was REALLY cold. A couple of photos from the Jan. 1, 1947 edition of The Dallas Morning News show a snow-dusted Cotton Bowl and two very cute Oak Cliff teenage girls ice skating on West Jefferson Blvd. I am working on a project now and the story has come up was Bywaters a better artist then Museum Director……in the late 1940’s and early 1950’s…. He was a better artist…since those images survive and the Museum is now in the Arts District………and that old Perry street road is long gone…. 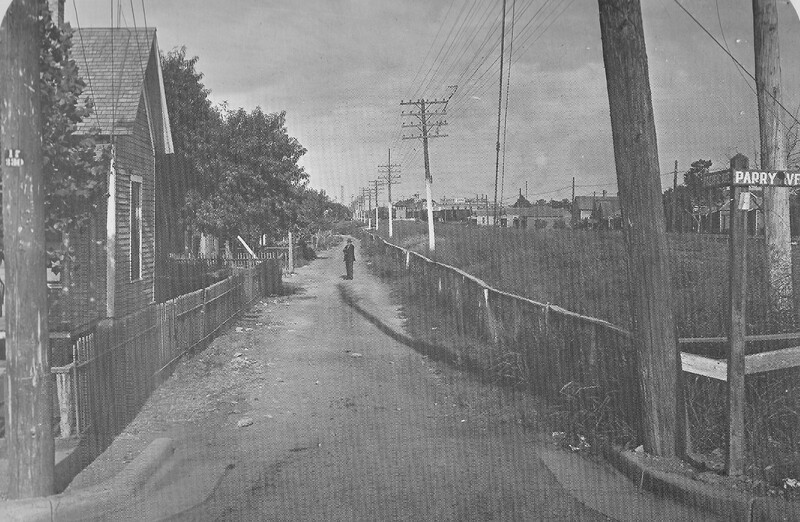 There was a third set of tracks on the boundary of the fairgrounds, not even including the streetcar tracks on Parry. 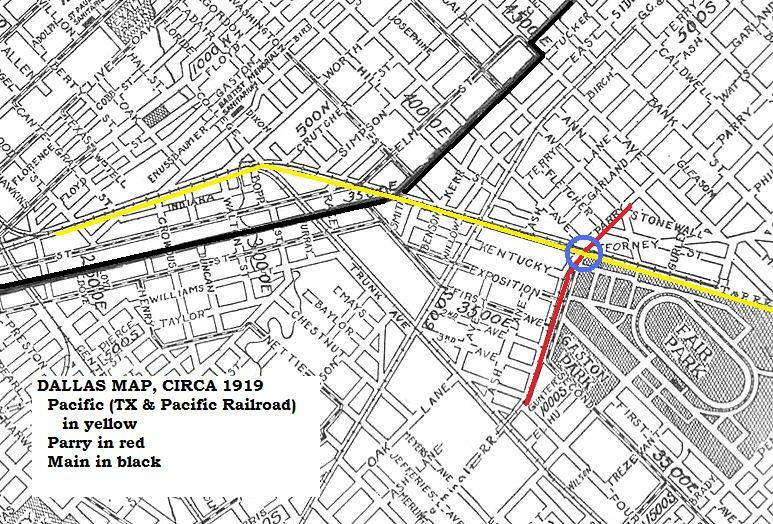 Actually, in addition to the streetcar tracks on Parry, there was a single rail line coming from the southwest connecting with the T&P. You can see the words Terminal R.R. on your map. That was the line operated by Cotton Belt subsidiary Dallas Terminal Railroad & Union Depot— no affiliation with Dallas Union Terminal. The old Cotton Belt depot at Commerce & Lamar (later the site of the Greyhound bus depot) was part of this switching railroad. Thanks, Dennis! It’s really amazing how many railroads ran through the city proper back then. I wonder how many people were accidentally run over by trains back then? Dallas is basically a Railroad and then transportation hub central, and bus stop, airport, car culture, it is all these things leading with roads…..to a main central area……this being the Metroplex when in the 1840’s it was also the beginnings of such, Fair park was the last Rail road port too Deep elm when it was a freight and passenger area, even in world war 2 the are was a location for prisoner of war Germans who rode the 2nd class train the the prison camp at the Fair grounds…..